Arsenal were crowned Europa League Group E champions last night after a 3-0 win away from home against FC Vorskla (who were also away from home). Unai Emery’s team, made up of young players, a smattering of experience, and Carl Jenkinson at centre-half, played very well, coped admirably with the kind of cold that saw brass monkeys huddling together on the streets for warmth (punctuated by the occasional clanging sound which nobody could quite figure out), and were more than worthy winners on the night. Eddie Nketiah led the line, we had Emile Smith Rowe and Joe Willock behind him, and on the bench a clutch of young talent and Henrikh Mkhitaryan who was obviously brought as some kind of insurance if we needed something if the game wasn’t going to plan. That plan, I’m sure, was to put ourselves in the kind of winning position which would allow the manager to give chances to some of the other young players, so with Zech Medley replacing Rob Holding in the second half, and Bukayo Saka and Charlie Gilmour coming on for Aaron Ramsey and Matteo Guendouzi, it all came to fruition. The goals all came in the first half. 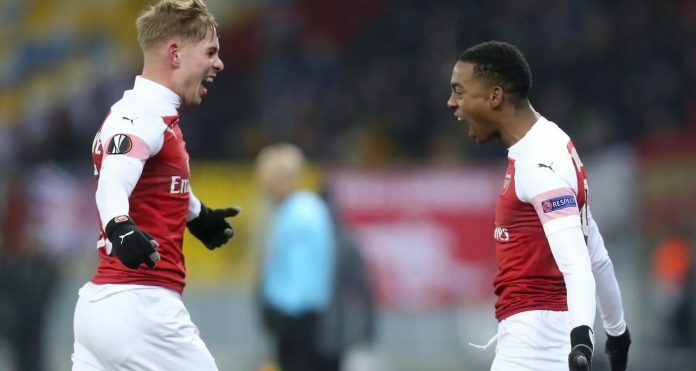 Smith Rowe opened the scoring in the 10th minute. Ramsey and Nketiah combined to work the ball into their box, the keeper and defenders were a bit all over the place, but take nothing away from the finish. The was slightly behind him, bobbling to him on a frozen pitch and he controlled it perfectly to put us ahead. That was his third goal of the season so far. Ramsey then won a penalty, and I think it was just about a foul so why not make sure the referee sees it? It’s one of those that would almost certainly be a free kick anywhere else, and if it’s in the box it’s a spot kick. The Welshman picked himself up and coolly dispatched it for 2-0. We dominated possession and territory throughout, Vorskla weren’t very good in fairness, but that’s to take nothing away from what we did. The third goal came from Willock who picked up an Elneny pass, drove towards their box, and curled it around the legs of the defenders and beyond the keeper for 3-0. His first ever goal for the club, and after that I felt he really grew into the game and put in an impressive performance. It was more of the same second half in terms of how we controlled the game. Even with the introduction of three teenagers we were still on top. Medley showed a couple of reassuringly cool touches at the back (MY KINGDOM FOR A LEFT-FOOTED CENTRE-HALF! ), Saka had a pop at goal after some skills in their box, and although Cech had to make one important save they barely threatened all night. The fact that Eddie Nketiah didn’t get a goal is something that will probably stick in his craw a little, he had a couple of sights of goal but couldn’t quite find the finish, but he had a positive night all-round and contributed well to the quality of our overall display. In the end, the best team won on the night; the best team finished the game with six teenagers on the pitch and Jenks impressive at centre-half in the context of this game, and all in all it was much more enjoyable than you might have thought this one would be when you looked at the fixture list. The individual quality was good and it was a big performance for us. We played with young players also and they are working with us in training every day. In the 90 minutes, the first thing for us is to win, and then finish the match with some substitutions and the end result. It was a good win for us and a few lads got their debuts, so we’re just happy to get the win. Every cup we’re in we want to win. We’re improving in every game and I’m very happy to be involved. He might have had two goals but for an errant offside flag, but he can be very pleased with his contribution. There’s such a lot to like about the way he plays and obviously it’s very early days, but when a player of his age can perform the way he does and also find end-product it augurs well for the future. As does the fact we can bring on so many young players and play the way we did. There’s a long way to go for all of them, and inevitably the high hopes we have for some won’t come to fruition, but as the pressure mounts in Premier League terms and the upcoming opposition means we’ve got a lot to do, there was something rather nice about this game. It was a kind of free hit. If you win, great; if you don’t, no big deal, but the optimum outcome was these young players showing their stuff and taking their chances – and I think they did that. We can all look at this game through the prism up the derby on Sunday and the trip to Old Trafford on Wednesday, but these lads will have thoroughly enjoyed themselves last night. For them it’s another little step forward in the early part of their careers, and it’s something we should enjoy for what it is, not what it is in comparison to something else, so well done to all concerned. For more on last night and a lot more on Sunday’s game, we recorded an Arsecast Extra for you last night, so listen/subscribe below. More news throughout the day on Arseblog News and over the weekend we can turn our attention to the derby and all that surrounds it.